Here I go again, with my Indian food kick. I just couldn’t pass up this recipe, even though it’s not exactly a pancake as such. It is definitely a griddle-cooked flatbread, though; so I say it’s fair game. 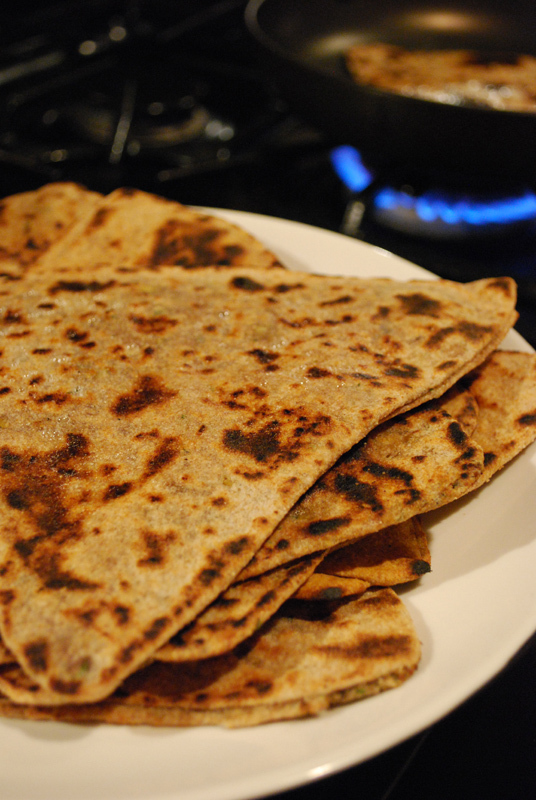 Parathas are similar to rotis, but are usually stuffed. Wait, what now? Well, a roti is an unleavened flatbread from India, typically made with atta flour (a finely stone-ground whole-wheat flour). If you take that dough, and stuff it with something, you end up with a paratha. There are different ways to stuff a paratha, though: by mixing the “stuffing” into the dough, then rolling out; by making a ball of dough filled with the stuffing, then rolling out, folding, and rolling more; or by layering two pieces of dough with the stuffing in the middle, and then rolling out. Parathas originated in the Punjab region, near the India-Pakistan border. They quickly spread, though, and are now ubiquitous throughout India, and well into Southeast Asia. They can be, and are, filled with anything imaginable, including eggs, peppers, meat, greens, fruits, poultry, peas, beans, sugar, et cetera. Anything that can be turned into a fairly dry filling (wet fillings tend to tear the dough) can be stuffed into a paratha. While a roti is considered a “daily bread”, because of its ease and simplicity, a paratha is seen as more of a special occasion bread, because of the relative expense involved in the stuffings, and the time involved in creating them. Though honestly, I don’t know when I’ve made a more complicated-tasting bread in so little time. Made only with the aforementioned atta, ghee (clarified butter), and water, the dough takes hardly any time to come together, and can sit in the fridge for a day or two. Additionally, while rotis are usually served with heartier foods, like curries and dals, parathas are often a little more substantial, and so are served with lighter fare. They are frequently dipped into or served with yogurt, and are a perfect match for a cool mango lassi. For the filling, you can of course substitute anything you like , but this filling is absolutely outstanding as written. I actually happen to have some black salt on hand, as called for in the recipe; and I highly recommend you try whatever gourmet salt you might be able to run across. Please just don’t use table salt. I know it seems snobby and very inconsequential, but it really does make a difference here, amazingly so. If you can’t find garam masala, you can make your own blend of whatever spices you like of the following: coriander, clove, fennel, cumin, peppercorn, cardamom, allspice, bay leaf, nutmeg, mace, cinnamon, and star anise. I highly recommend investing $15 in a half-decent coffee grinder (only used for this purpose! ), and buying whole spices to grind yourself whenever possible. This usage here is one such ideal application. Pre-ground spices just aren’t the same! Trust me – once you’ve ground your own, you’ll never be able to go back! 1. Mash beans in a bowl with a fork or potato masher. Stir in remaining ingredients. 1. Stir together flour and salt in a bowl. Add 3 tablespoons melted butter and mix with a fork until evenly distributed. Add 1/2 cup water and mix with a fork until incorporated. Add just enough additional water (1 to 2 tablespoons) to form a dough. Knead until smooth and elastic, about 10 minutes. Place dough in a lightly-oiled bowl, turning to coat, and cover with plastic wrap. Let stand at room temperature 1 to 3 hours, or refrigerate at this point. 2. Divide dough into 8 equal portions and roll each into a ball. Keeping the remaining balls covered with a dampened kitchen towel, push your thumbs into center of each ball to make a depression and fill with 1 tablespoon bean filling, closing dough around it, and pinching to seal. Flatten ball into a disk and roll out into a 6-inch round on a lightly floured surface with a lightly floured rolling pin. 3. Brush with some of remaining butter and fold in half. Brush half-circle with butter and fold in half again to form a quarter-circle. Roll out into a triangle with roughly 6-inch sides on a lightly floured surface with lightly floured rolling pin. Put paratha on a baking sheet and cover with another dampened kitchen towel (not terry cloth). Repeat with remaining dough. Do not overlap parathas, or they will stick together. 4. Heat a dry 10- to 12-inch nonstick pan, cast-iron skillet, or griddle over medium-high heat until hot, then cook parathas until bubbles form and undersides are browned in spots, about 1 minute. Brush top with the additional melted butter and turn paratha over. Brush cooked side with butter and cook until dough is cooked through and underside is browned in spots, 30 seconds to 1 minute more. Serve warm. 1. If needed, you can make the dough one day ahead and keep covered in the fridge. Just make sure to let it sit until at room temperature before proceeding (it took mine about an hour). 2. I found it necessary to firmly pinch the dough together, so that the filling didn’t come through the dough while rolling out. Even so, it wasn’t always successful. Once the filling starts poking through, start the folding procedure. Remember, it’s better to roll the dough a little bit many times, than it is to roll it all at once. Just do what you can with each piece, set it aside, and move on to the next piece.